Where are you on your gift-giving? Are you one of those amazingly organized people that have everything bought and wrapped by Thanksgiving? Or are you more like me and have to let the turkey digest before you start planning for Christmas? I aspire to be one of those done-in-October people every year, but I’m always left scrambling around in November and December like a madwoman. We usually spend Thanksgiving at my Grandma’s house. Sometimes we try to hit all our family on our annual trip, but this year we opted to just go to Grandma’s. Which means that these three days before Thanksgiving are a little more relaxed and I have a few moments to consider a game plan for Christmas. And make some printable gift tags! Get your free high-resolution copy of these tags HERE. You’ll have to download the file and then you can print as many tags as you need. With an almost cartoon-feel to them, they are perfect for the kids or the kid-at-heart. And who doesn’t love to let some of their inner kid shine through, especially during the holidays! I would highly suggest printing these out on cardstock, but that’s completely up to you, of course. 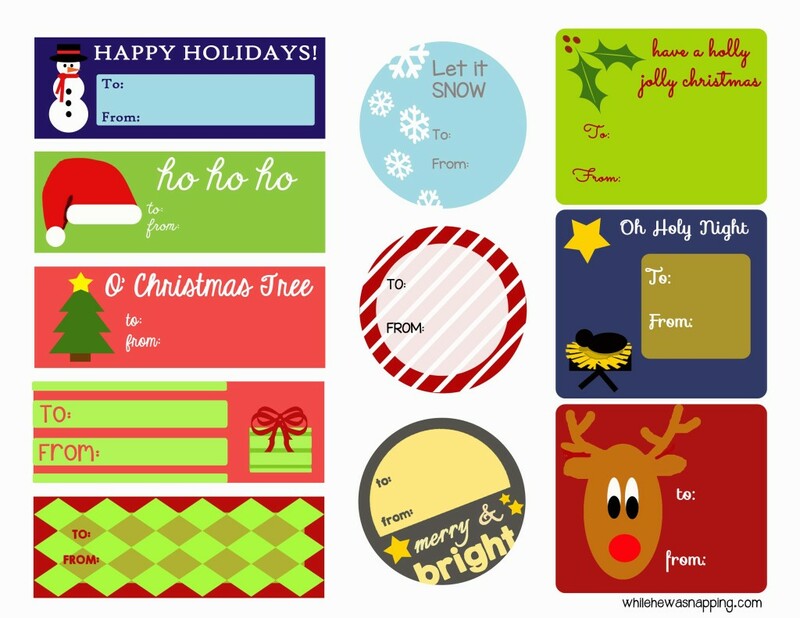 After you print them, cut them out and you can stick them down with gluesticks or tape. Or you could always use a hole punch and attach the tags with ribbon. Need some ideas for ways to make these tags even better? – Print the tags on self-adhesive paper and you’ve got yourself some awesome stickers, just like you can buy in the store… but so much cuter. – Put colored paper behind the tags to create a great layered look. Use a paper crimper to add some fun texture. Or use small shape punches. – Want to tie your tags on with ribbon? Put a small piece of tape (clear Scotch tape or cute washi tape would work well) over the tag and then punch the hole through the tape and the tag to help prevent the tag from ripping through. – These would look fantastic with brown paper bags or packages… those are, indeed, a few of my favorite things.